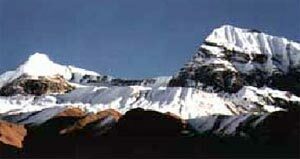 The climbing of these peaks are controlled under the rules and regulations formulated by this Association. To climb this beautiful but challenging trekking peak one should need a permit and experienced climbing guide and should go through the registered trekking companies of Nepal. It is true that the previous experience is not necessary to climb the Trekking Peak. However, you must be prepared mentally as well as physically for this adventurous expedition. Adventure Silk Road provides personalized and friendly services to the valued adventure travelers. We are fully organized to provide any support of any kind of trekking peak & obtaining permission, providing support staffs including high altitude climbing assistants & porters, Cook. Please write to us of your requirements & we shall for ward to you more details with tentative trekking peak cost. We are operating following Trekking Peak Climbing & Mountain Expedition in Nepal Himalaya. Tharpu Chuli (Tent Peak) Climbing-5663m, Ramdung Go Peak Climbing - 5925m, Paldor Peak Climbing - 5896m, Pokhalde Peak Climbing - 5806m, Pisang Peak Climbing - 6091m, Pharchamo Peak Climbing - 6187m, Mera Peak & Amaphu Lapse Climbing - 5415m, Meera Peak Climbing - 6654m, Mardi Himal Climbing - 5587m, Lobuje Peak Climbing - 6119m, Kusum Kangru Peak Climbing - 6367m, Kongma Tse (Mehra) Peak Climbing - 5849m, Island Peak Climbing Via Chola Pass - 6183m, Kwangde Peak Climbing - 6011m, Chulu East Peak Climbing - 6584m, Mera Peak Climbing, Hiunchuli Peak Climbing - 6441m, Ganja La Chuli (Naya Kanga) Climbing - 5844m, Chulu Weast Peak Expedition - 6419m, Island Peak Climbing Via Kalapattar - 6183m.